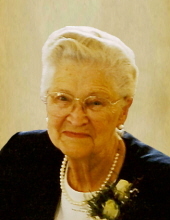 Alice Grove, age 107, of New Hampton, IA, passed away on Wednesday, January 23, 2019 at New Hampton Nursing and Rehabilitation Center in New Hampton. Funeral services for Alice will be held at 10:30 AM on Sautrday, January 26, 2019 at the Congregational United Church of Christ in New Hampton with Reverend Candraeah Carey officiating. Visitation will be held from 9:30-10:30 AM prior to the church services on Saturday. Interment will be in New Hampton Cemetery, New Hampton, IA. Memorials may be directed to Alice's family as well as the Congregational United Church of Christ and the New Hampton Library. She is preceded in death by her parents Henry and Verna Hartman; her husband Glenn on March 4, 1991; one grandchild Mark Gerald Laures; one great-grandchild Emily Anastacia Sexton and one great-great grandson Eli James Grove. To send flowers or a remembrance gift to the family of Alice Grove, please visit our Tribute Store. "Email Address" would like to share the life celebration of Alice Grove. Click on the "link" to go to share a favorite memory or leave a condolence message for the family.